Every trend, genre, sport, hobby, music, art, etc. all have their “golden era” where things are in their prime and the ideas are original and refreshing. You may recall the golden era of hip hop, which took place in the ’80s and ’90s and stemmed from a West Coast vs. East Coast battle of style, taste, and preference. The term “six-fo” is mentioned throughout these two decades of music and appears in some of the most iconic hip-hop tracks and music videos of all time. 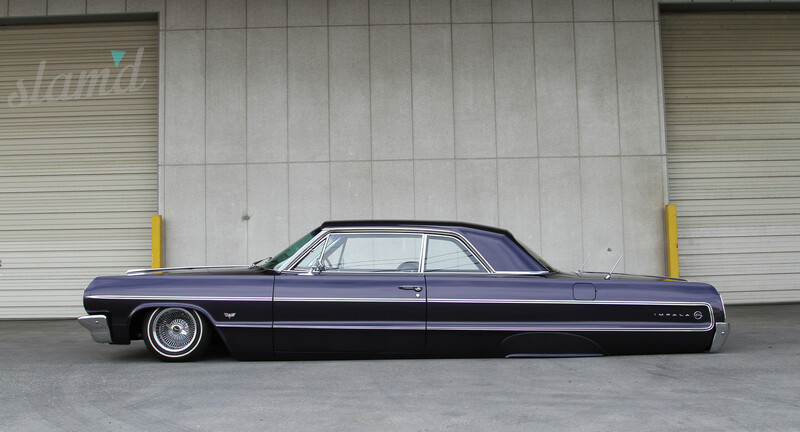 One of these songs, still widely played today, was Ice Cube’s “It Was a Good Day” which plays well with lowriders and classics, and is especially fitting for this beautiful 1964 Impala featured here. 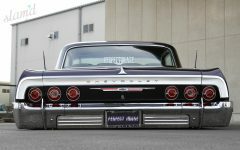 Read along as we provide the details on Kamal Fernando’s 1964 Chevy Impala – the Horizon ’64 straight from the streets of Japan. 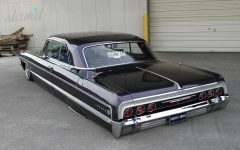 Kamal Fernando, the current owner of this super Slam’d body-dropped Impala, picked up the car from the original builder/owner Mr. Tamura. 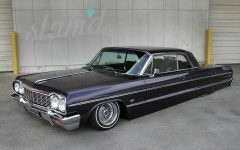 Now, Kamal was on the hunt for the perfect lowrider to cruise the streets of Japan and his search was over when he found Horizon ’64. 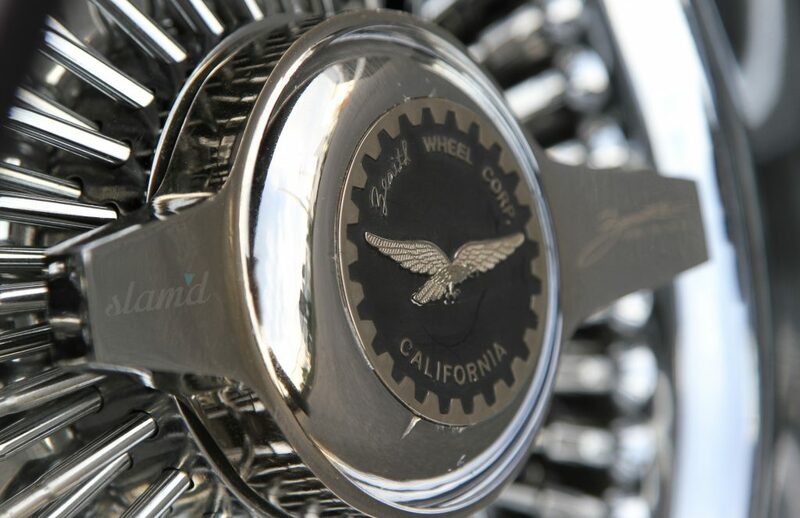 Kamal knew that the famous builder, Mr. Tamura, is no stranger to the custom car culture, specifically lowriders and has built numerous full customs that have appeared in Lowrider Magazine and others. 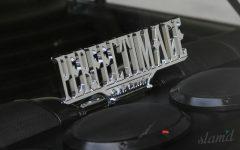 As the owner of Perfect Image Hydraulics in Japan. 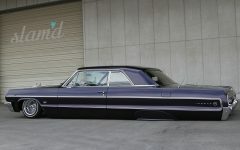 Mr. Tamura previously built Amethyst ’64, which was the cover car of the very first issue of Lowrider Magazine Japan in 1993. Kamal had his own sister ride to Mr. Tamura’s car however it was not the same in his mind. His car resembled Horizon ’64 in many ways, which included the iconic purple paint. When it came time that Horizon ’64 was up for sale Kamal was first in a very long line of would be “suitors” as this car was now known worldwide. After quickly selling his car, Kamal was able to slap down the yen needed to obtain the rights to his dream car. 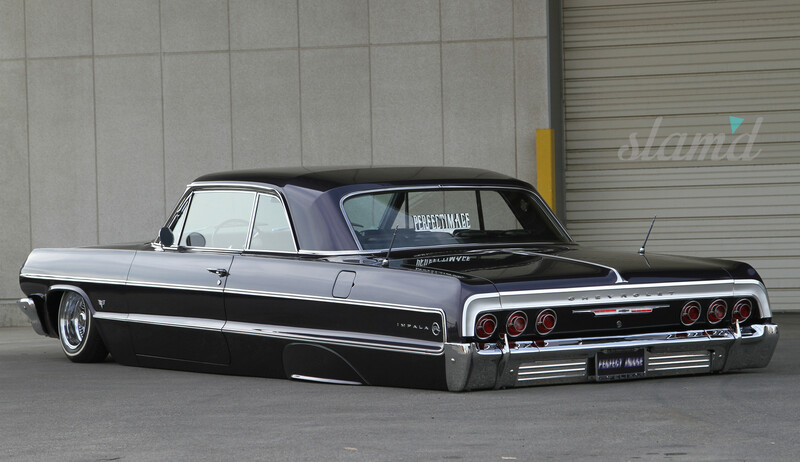 As you can see, this isn’t your normal “Six-Fo” Impala build by any means. 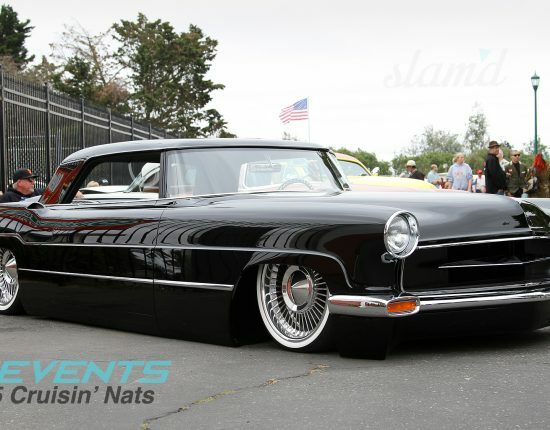 One of the first things you notice is the ultimate low, pavement hugging stance. 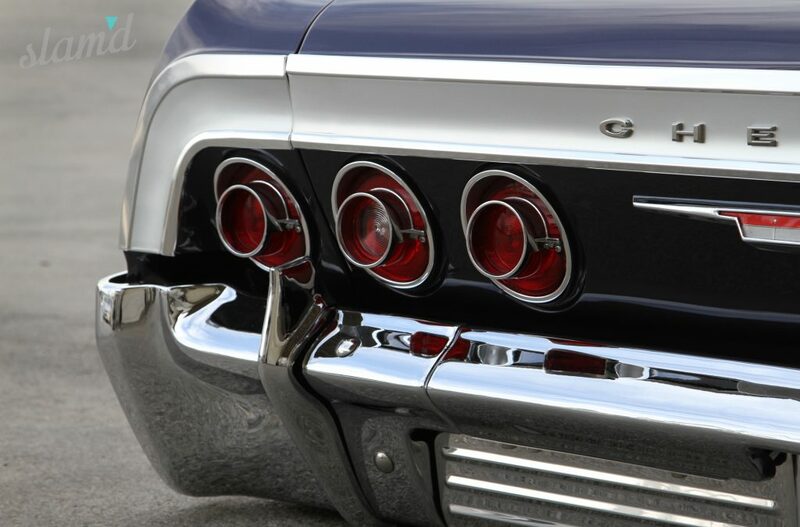 Instead of just simply lowering the car and utilizing hydraulics and calling it a day, they decided to go the extra mile and build a truly one-off creation by channeling the Impala and building everything from the ground up. Custom upper and lower control arms were constructed utilizing 6-inch hydraulic cylinders with custom one-off mounting cups to help clear the Classic Performance Products (CPP) brake setup. 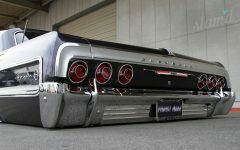 When going this low, Mr. Tamura knew he would run into multiple challenges along the way, but he was ready to solve them as the build progressed. The steering shaft was a fun chore, reworking it to clear the headers. 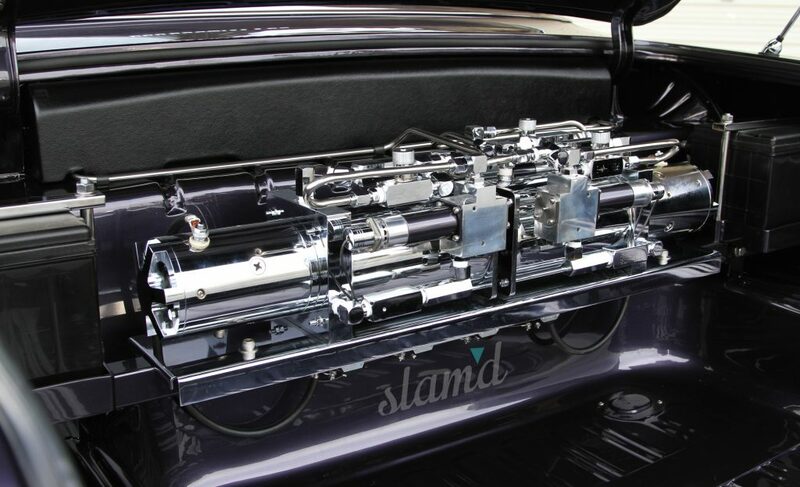 Out back a custom triangulated four-link centered the axle and a custom crossmember was crafted to tie in the shocks to keep the Impala cruising’ down the street smoothly, something that Eazy-E would also approve of. The frame rails were re-arched and 10-inch hydraulic cylinders were installed. 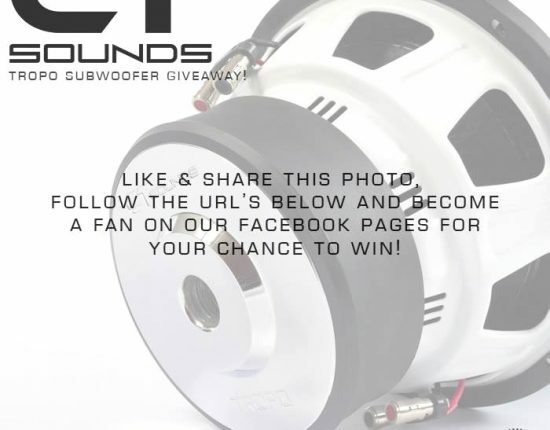 Also, to ensure the 13-inch Dayton wheels cleared the fender skirts the rearend housing was narrowed. 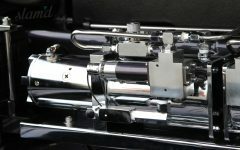 Two chrome pumps with two batteries are paired with Adex square valves, to help with the front, back, and side-to-side duties. 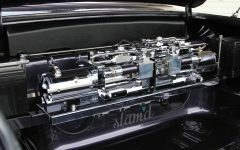 The plumbing of the hydro setup is the icing on the cake and a true work of art, with the level of detail that Perfect Image Hydraulics is well known for creating in each and every build. Lastly, the CPP four wheel disc brakes help with the extra stopping power. Up next, the purple metallic paint really sets off this inspiring ride to perfection. 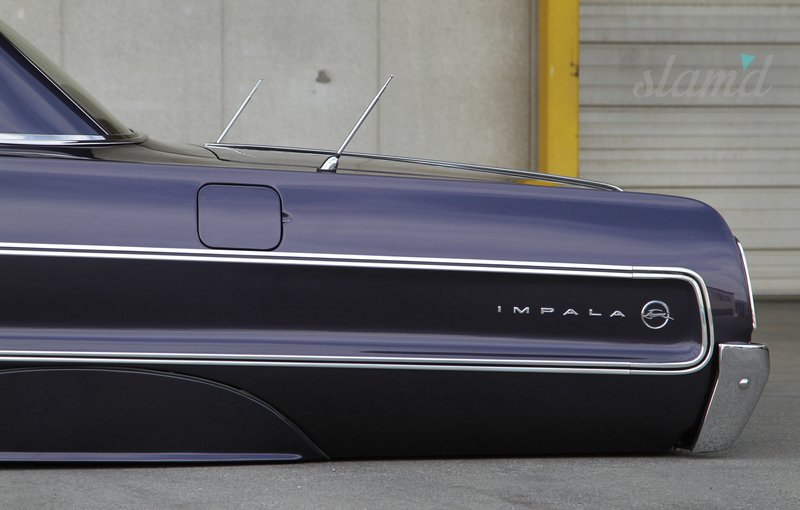 What you may not notice are all the additional body mods that went into the car to make it a truly custom creation. 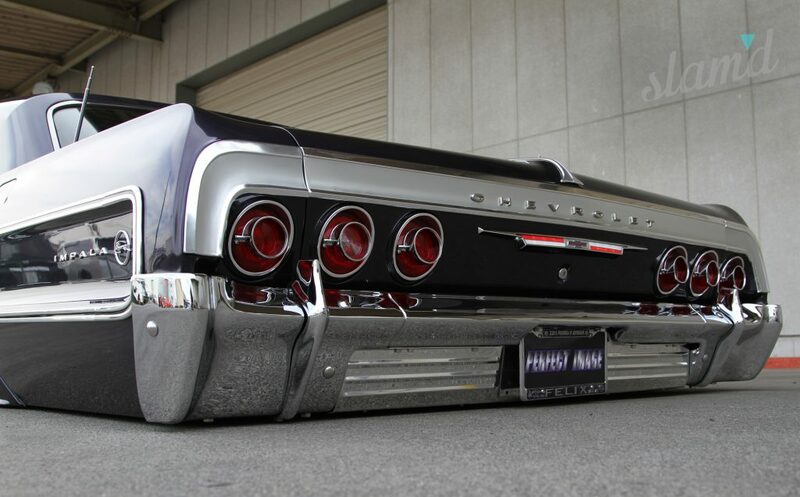 The floorboards were channeled 4-inches along with the trunk floor being raised 6-inches to clear the framerails. The transmission tunnel was raised to accommodate the drivetrain and the firewall was completely shaved. 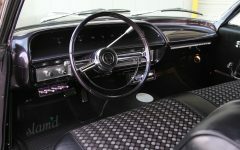 They had to raise the dashboard slightly to accommodate the raised floorboards, however they re-mounted the front seat to allow for as much headroom as possible. The Perfect Image crew even went through the daunting task or raising and reinstalling the rear package tray. With such heavy body surgery it was imperative that they painstakingly gapped all of the body panels to ensure proper final fitment. 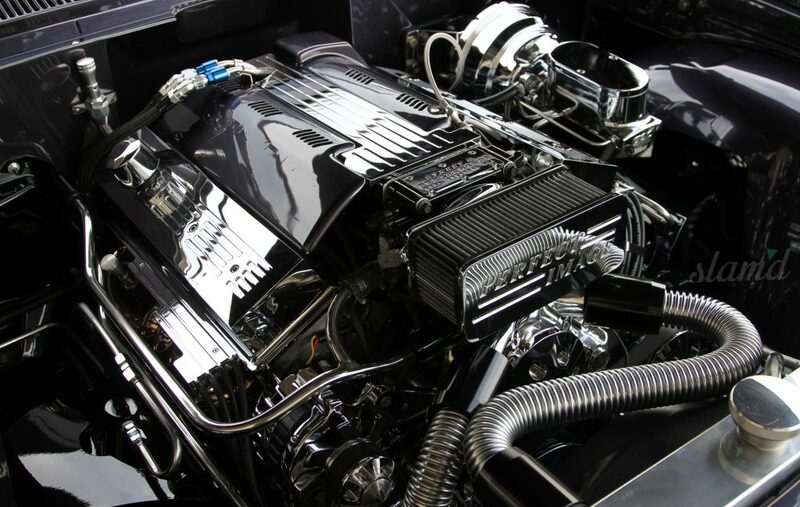 After several years of showing the car with the original Chevy power plant Kamal decided to make some changes and install a fuel-injected motor. 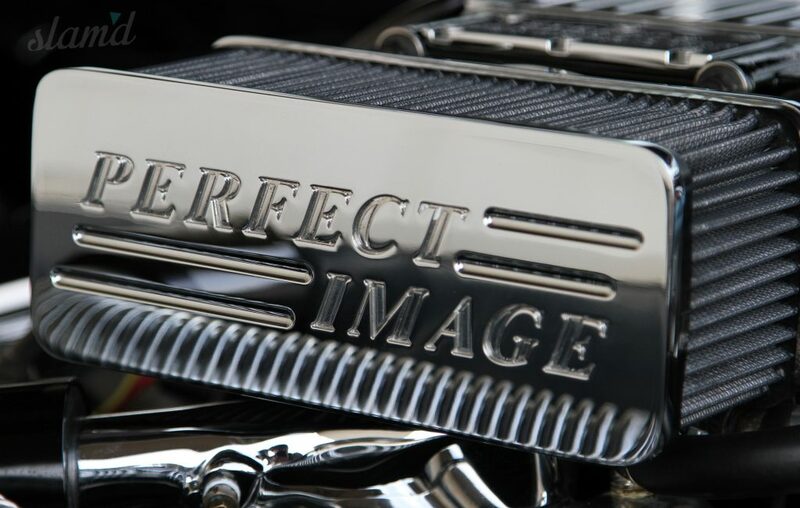 Perfect Image Hydraulics performed a motor swap with a Chevrolet LT1 from 1992 Corvette. 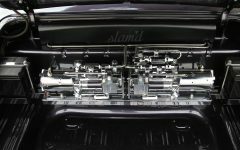 The fuel injected LT1 really takes on a life of it’s own when the pedal is laid to the carpet in this classic cruiser and added that extra bit of power and reliability that Kamal was looking for. That’s right, he loves to drive his Impala any chance he gets to shows both near and far. 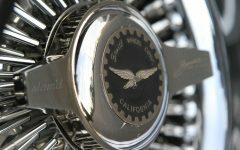 And of course the motor is detailed to the nines and includes plenty of chrome, stainless and polished pieces that one would come to expect on a such high-end lowrider. The sound of the exhaust existing the dual stainless steel pipes almost reminds you of the scene in Boyz ‘N The Hood when Dough Boy hammers down the throttle seeking revenge for his brothers’ death. But there are no “gangsta” duties for Kamal, he’s just glad that everything worked out and definitely enjoys chirping out whenever he can. 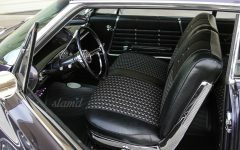 When it came to the interior of this American classic it was decided that Detroit got this one right. 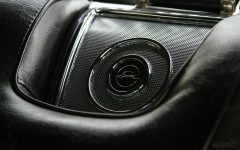 The car retains mostly a stock interior with some classy upgrades. 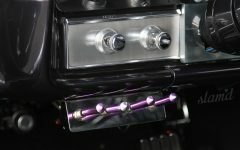 To ensure the LT1’s vitals stay in check, Perfect Image installed a set of custom purple colored Dakota Digital gauges. 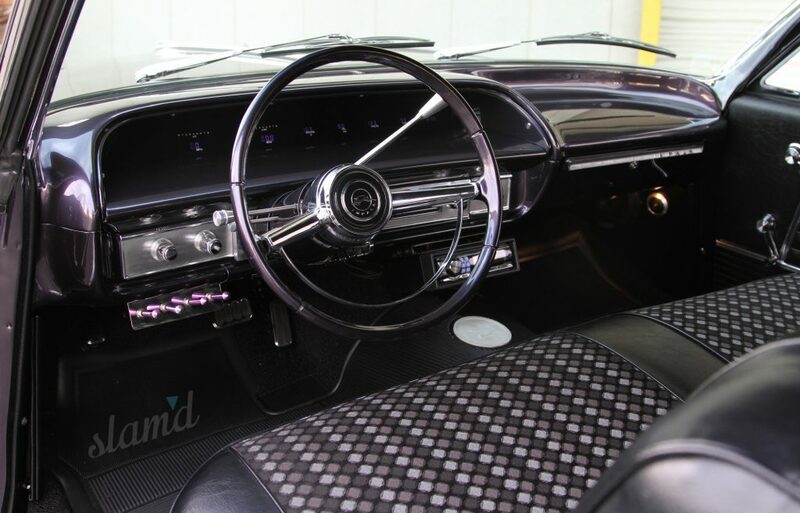 The one piece gauge setup is a very popular option for these Impalas and looks right at home inside the stylish lines of the 1964 dash. An Alpine head unit was installed under the dash to give Kamal easy access to switching out his NWA, Dr. Dre, Eazy-E, and Ice Cube CDs. Rockford Fosgate mids, highs, and subs were installed because what’s a badass lowrider without a thumpin’ audio system. Creating a truly inspiring and unique custom is no easy feat these days. Although time, funds, support and ability play a major role in any build – it’s the vision that truly makes any creation a work of art. Kamal would like to thank his wonderful girlfriend (and model) Mai for all of he support. Although Perfect Image Hydraulics closed at the end of 2013 their tremendous work and passion lives on in the rides they created like Horizon ’64. 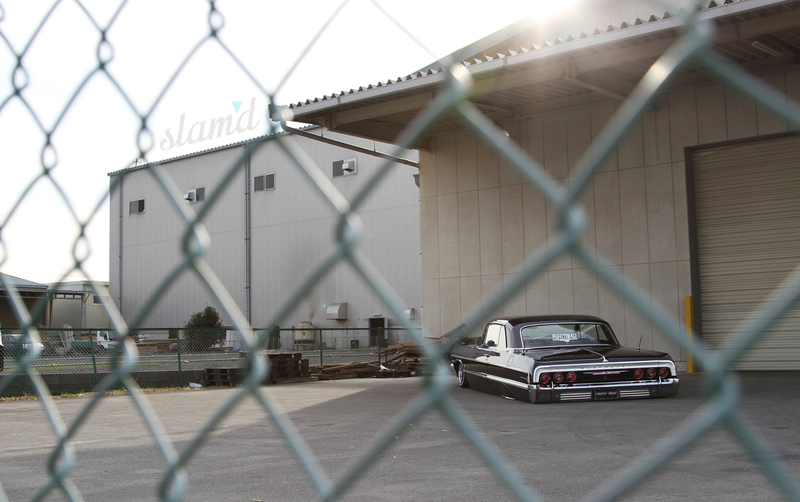 Additionally, Kamal wanted to send a very special thanks to Mr. Tamaura for his vision and contributions to the lowrider and custom car scene in Japan. 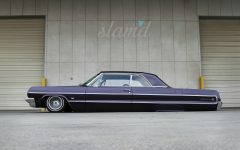 Although we don’t feature a ton of traditional lowriders here, top to bottom this is the type of unique vehicle that we live to showcase here at Slam’d Mag. *Editor’s Note: A huge thanks to Makoto and Shingo for their help setting up this shoot during our visit to Japan!